Eid-ul-Azha, one of the largest religious festivals for Muslims, has arrived again. Nearly 90 percent of Bangladesh's population are Muslim, and they will, no doubt, want to mark the festival with considerable extravaganza. However, sheer poverty will not allow an overwhelmingly large proportion of the population to celebrate the festival in any serious sense. For the 40 percent of the population who live below the poverty line (living on less than $2/day), the rituals of Eid is a form of indulgence they can't even imagine. For more than 50 percent of Bangladeshi women who suffer from chronic energy deficiency caused by malnutrition, the Eid will probably be of little consequence. For the 56 percent underweight preschool-age children, who are hungry, the Eid will make little difference. For the people who have 'inherited' undernourishment (it passes from one generation to the next) from their parents, the euphoria of Eid will be farcical. And for many of the families in lower income brackets, who are struggling to make both ends meet with the price of everyday essentials shot through the stratosphere, festivals, in general, are a burden. 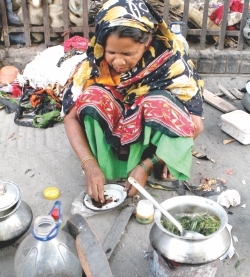 Asma, an elderly woman from Jamalpur, lives in the slums along the railways tracks in Tejgaon and works in the nearby market. She doesn't have any savings to survive the Eid holidays, when the markets will be closed. 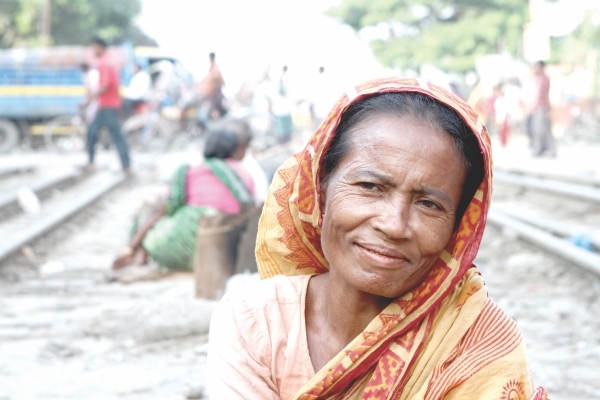 “I came to Dhaka because I have no lands or any other means of earning in the village. My husband is old and not fit for farm labour. So I left him lying on the chouki (wooden-bed) a few years ago,” she says. In most of the mainstream scholarship, the high rate of population growth is blamed for widespread poverty and malnutrition. In 1971, our population was 75 million. And according to the United Nations Population Fund (UNFPA), the country's present population is 15.05 crore. The size of the population simply doubled in the last 40 years. But our national food production has also gone up from 10 million tons in 1971 to 34 million tons in 2009, says an estimate. The national food production has tripled since independence. Considering this, it seems rather strange that so many people have to suffer from malnutrition in this country. The skyrocketing price of food also leaves us bewildered when we consider how the growth rate of national food production had exceeded the growth rate of population. It must be noted that the middlemen and a few price-fixing cartels control the sales, distribution and price of food and other everyday essentials in this country. The 'free market', which is the heart of our economic system, is also controlled by them. They are the ones who get enormously profited from the rising prices of essentials, while news of farmers selling their crop at a loss is frequent. Coming back to the homeless in the city, hundreds of thousands of rural people migrate to Dhaka every year. People dispossessed by river erosion and other natural disasters comprise a high proportion of the destitute in the city. 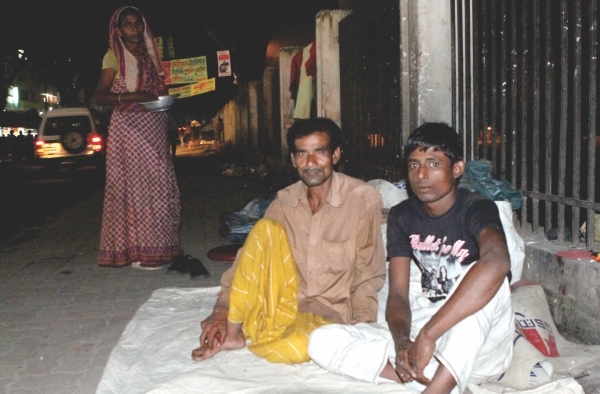 Indebtedness, lack of work and sheer poverty also drive them to Dhaka. In addition, there are the 'development' schemes that not only have disenfranchised thousands but also have destroyed the physical environment. The export-oriented commercial shrimp farms in the southern and south-eastern coastal region of the country, for example, have occupied more than 200,000 hectares of land for shrimp farming, according to an estimate by Bangladesh Paribesh Andolan. Paddy fields, grasslands, and ponds have been made to contain the brackish water necessary for shrimp farming. The resulting rise in salinity in the region has deprived thousands of people of their elementary necessities for survival (i.e. drinkable water), not to mention the destruction of the habitat for bugs, insects, fishes, wild plants, and birds. The shrimp farmers are rather rich. And the people dispossessed by the farming are rather poor. It is often argued that export oriented industries like shrimp farming has made significant contributions to the growth of GDP per capita of the country. But the method of determining GDP per capita is intriguing: the country's GDP is divided by the total number of people. In other words, it is an average of the income of the multi millionaire entrepreneur and the person who live below the poverty line. The peasants of Satkhira, Khulna and Bagerhat, migrate to Dhaka, after losing every hope of survival in their village. Not everyone who moves to the city in search of employment find work. In turn, the city, like a giant outsourcing business, needs a virtually unlimited supply of cheap and unskilled labour. The current of poor, homeless people into the city fulfils that demand. They are the reason why rickshaw pullers, chauffeurs, construction workers, kulis (porters), security guards, domestic helps and garment workers are always at hand, waiting to be hired. The urban middle class needs them. Unlike food, the sheer number of these people, their desperation, and the endless supply of them keep manual labour cheap in the city. And there is no price-fixing cartel for them. If they are lucky, they will get to have a fulfilling meal on Eid day. “The assurance of food for a couple of days is like an Eid to me,” says Nasir, a rickshaw puller who sleeps on the footpath near Farmgate at night. 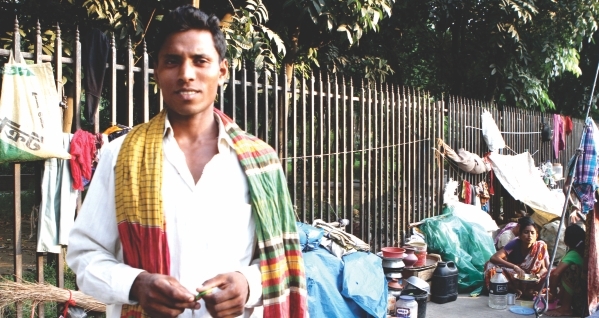 Muhammad Rafiqul Islam, who works as a kuli (porter) at Kawran Bazar, says that he came to Dhaka from Lalmonirhat to make some extra money before Eid. “The amount that I earn from my work as a farmer is meagre. If I can manage to save and take something back to the village, I'll be able to buy some gifts for my wife and son,” he says. However, not all the migrant peasants get hired in the city. “There is no work in the village in this part of the year. And nobody in the city gives me a job in my old age. 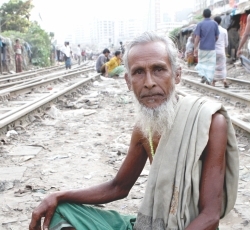 So, I've got nothing to do but beg in the streets,” says Matiur Rahman, a widower, who sleeps in the markets of Kawran Bazar and Tejgaon. Rahman’s only a son lives in Jamalpur with his own children. He cannot even afford to go back to his village before Eid. As the nation celebrated Eid-ul-Fitr, a couple of months ago, hundreds of people from the districts in North Bengal hit the headlines by selling their kidneys in the hospitals of Dhaka. They saw no way out of the debt traps they were caught in by the NGOs but to sell their kidneys. We do not know what that Eid meant for them. In the Kafkaesque world we live in, the prospects for a more equitable distribution of wealth eludes us as an overwhelmingly large population shears away in the dark.